Earlier this week I have set up a sked via eQSL.cc with Tom DL4NSE and William PA0WLB, who needed OZ. I figured that there would be plenty of time to raise the DX-88 during Saturday and have some QSOs during the following days. Nevertheles, I brought all my portable gear with me, consisting of the FT-817, MP-1, ATX-1080 and the Miracle Whip. This turned out to be a very good idea because I didn’t really bother to go and find a support mast (again!) and spend several hours in tuning the antenna. Instead, I decided that I would try to do something with the MP-1. I started on Saturday, 29th October on 40 meters and I tuned the antenna using the FT-817 connected directly to the feedpoint. This, however, turned out to be inadequate, since even with 0 bars on the FT-817 SWR meter I had astronomical SWR on the IC-765 back in the shack. Thus, I had to run in and out many times until the SWR was as low as possible (1.5:1). Once the antenna was tuned (1420 UTC) I started to call CQ on 7.017 MHz and it didn’t take long before I was having my first QSO: UT5EDO who gave me 599. After him I had several other QSOs with OK, SM and DL, all of them giving me very good reports. I was very positively surprised how well the antenna performed in this setup. Ok, I was on the dark side of the force using 100W output but still, we are talking about an antenna with an effective radiating length of 1.5 meters on the 40 meter band. I was impressed. Later in the evening the 40 meters band became useless. Some obsessed maniacs participating in the CQWW SSB contest used the CW section of the band to terrorise each other and the rest of us, using their 5 megawatt spread spectrum signals. Thank you very much, guys! I would really like to know the opinion of the contest comitee concerning this matter. Sunday morning 40 m was still quite useless. Therefore, I decided to try the elevated MP-1 on the other bands as well. I tuned it up on 30 m obtaining SWR 1.5:1. I made many nice QSO with the neighbouring parts of Europe between 09-11 UTC. I backed a little on the power knob and was using 50-70 watts, but I also had QSO with SP9MRO/8 using 15 watts only. After all, the interesting stuff here at the end of the day is what can you do with this antenna using low power. At 11 UTC I re-tuned the antenna to 20 m and, after QSO with UA4PA, I was working W2EZB using 50 watts. We exchanged 549 both ways. After some more Eu QSOs, I went on to 17 m. Here I got the SWR down to 1.2:1 and soon I was working K8CW, W4MQC/1 and WD8JOL. I was using 100 watts and I guess the band conditions were rather good. For example, WD8JOL was working QRP with his K2 and I gave him 439, so still quite readable. In the evening I went back to 40 m, but this time I attached an extra radial/counterpoise of 10 meter length. The SWR seemed to go down to 1.4:1 whereas it was 1.5:1 earlier without the extra counterpoise. I agree that this difference is very small and may as well have been due to other conditions, like air humidity. In any case, I had several nice QSOs, inluding OK1FHL, whom I worked using 10 watts. I was getting closer and closer to QRP again. CO8LY called CQ and there were no takers but VP5/WA2VYA was having a rather big pile-up, so coming in at the second call was quite impressive. All in all I am very pleased with the performance of this antenna. Clearly it has two big advantages as compared to the ATX-1080 and the Miracle Whip: First, it can handle powers up to 150 watts so that you can use it even when you have temporarely lost you mojo. Second, the construction allows it to be mounted in many different ways. It was really easy to mount it on the tripod, so I will have to withdraw my previous statements about this antenna being somehow clumsy and difficult to handle. From time to time the performance seemed comparable to the DX-88, although this may have been due to good openings on the bands. In any case, it was much easier to set up for the weekend than the DX-88 used to be and I was doing many, many QSOs. A few issues still remain, though. One of them is the pain of tuning the antenna when changing bands. It’s no problem if you go for monoband operation or if you sit right next to the antenna, but it can be a pain in the a^Hneck if you are separated from it by tens of meters of coax. 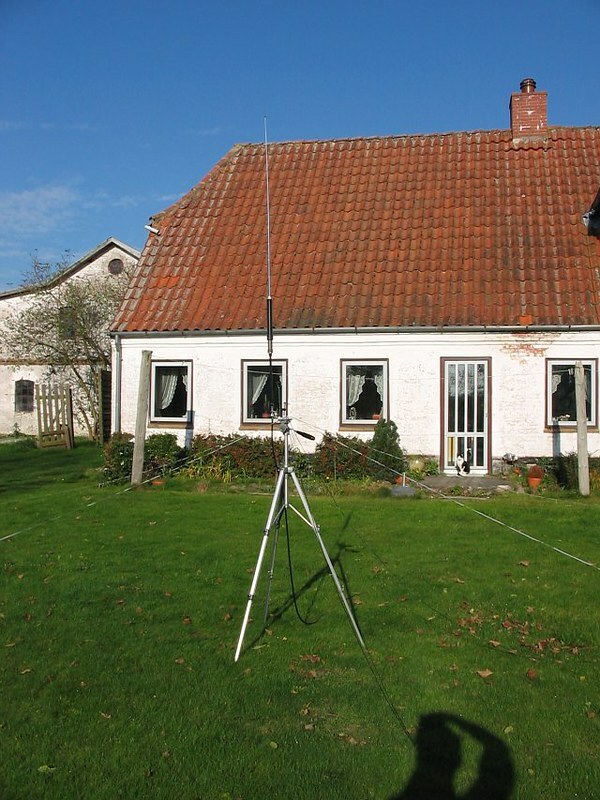 The good part of this issue is that you can tune the antenna continuously between the 40 and 6 meter bands. The second issue is the performance on the RX side. Many times, my RST was much better than the RST I sent to my QSO partners. This can be due to many things, but the most likely cause is either people beeing too polite giving me better reports than I gave them, or the antenna performance on reception is 10-20dB lower compared to a normal antenna. This will require some more investigations.